This character is a deity, Cosmic Entity or Anthropomorphic Personification in the setting that represents chaos in some form. What that chaos is meant to represent varies; randomness, entropy, destruction and being unpredictable are common traits of the god of chaos. Discord and anarchy are common attributes as well. Their morality varies. Many gods of chaos are outright evil, and fall under the God of Evil label. Maybe they have a morality incomprehensible to mortal beings, assuming they aren't just insane or completely mindless, that is. They're usually an Eldritch Abomination as well, who are often associated with chaos and disorder anyway. Sometimes they're a more neutral trickster figure or Great Gazoo, though few can be called outright good. If they have a goal outside of amusement or promoting chaos, it's either opposing order or trying to bring about a World of Chaos. If Religion Is Magic, those who worship the God of Chaos would use Entropy and Chaos Magic. Usually depicted either in opposition to the other gods or The Friend Nobody Likes. If there's a Top God, the God of Chaos is often either The Anti-God or the setting's Satanic Archetype. If the Primordial Chaos appears, the god of chaos might represent or be it. Yu-Gi-Oh! ZEXAL: Don Thousand serves as the God of the Barian World which represents chaos, which is in opposition to the Astral World's order and its god Eliphas. While Don Thousand is evil and wants to merge Earth and the Barian World together, chaos in itself isn't inherently evil and is the force that powers life and emotion. Marvel Comics has a number of chaos gods, most of them being malevolent. Lord Chaos is the Cosmic Entity that embodies chaos while his brother Master Order embodies order. Unusually for this trope the embodiments of order and chaos work together instead of opposing each other, and created the In-Betweener to represent dichotomies and balance in nature. Amatsu-Mikaboshi, the Chaos King, is the primal god of chaos from Shinto legend that serves as the Big Bad in Chaos War. Predating reality, its motivation is to destroy the multiverse so as to return to the peaceful state of nothing it once came from. The Chaos King is later revealed to be just a tiny aspect of Oblivion, the Cosmic Entity representing nothingess and non-existence. Various Doctor Strange characters like Shuma-Gorath and Chthon are said to be Lords of Chaos, though outside of having a Chaotic Evil alignment don't really represent chaos as an ideology. Chthon is the source of Chaos Magic, which is so dangerous that magic users suppressed any knowledge of its existence. The DCU has the Lords of Chaos embodying chaos, as opposed to the Lords of Order embodying order. While initially treated as evil with Doctor Fate's Arch-Enemy Mordru being a Lord of Chaos, later stories have portrayed chaos in a more sympathetic light. Malibu Comics' Mortal Kombat has Zaggot, the God of Chaos, an Anthropomorphic Personification who looks like a hobo version of Gandalf who reigns in chaos and wants to get the world summed in chaos. He first appeared in the Goro: Prince of Pain miniseries as the one who takes him off the first game to be his champion. In general The Mask comics series is about the eponymous mask made by magical African Indians (in The Movie was made by the god Loki) who converts its wearer into "Big Head", a unstoppable agent of chaos capable of blowing up an entire city to ashes, depending of the user of course. The Harris age of Vampirella comics introduced the evil god Chaos as a recurring villain, who rules Hell and opposes the forces of Order (including Vampirella) either directly or through his many acolytes. He's pretty much just a stand-in for the Devil, right up to looking like your standard scary big red demon, but his chaotic nature is reflected in his disordered mindset. 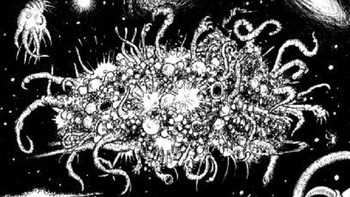 Cthulhu Mythos: Azathoth, depicted in the page image, is a being of pure chaos who created reality by pure accident and will be equally oblivious when it destroys it. It's been referred to as "the Nuclear Chaos", and is the eventual source of all the other bizarre gods and monsters in the mythos... and of everything else, for that matter. The Outer Gods' herald Nyarlathotep also represents chaos as the Crawling Chaos, but is more about causing discord and panic on a human level than vast cosmic upheaval. N. K. Jemisin's Inheritance Trilogy: Nahadoth, first of the Three Old Gods and co-creator of the universe, embodies Chaos and change. He is not evil per se, but doesn't align with human morality most of the time. It doesn't help that he's endured 2000 years of Sanity Slippage from being trapped in human form or that he's shaped by the belief of mortals around him, most of whom see him as a terrifying monster. Tamora Pierce's Tortall Universe story Realm of the Gods has a goddess of chaos fighting the other gods. At the end of the book Daine fights her directly in a Shapeshifter Showdown. Everybody Loves Large Chests has one of these. The book makes it a point to never describe him (her? it?) the same way twice. He even proves his identity by asking the characters to say his name three times. They say three completely different names. This is because, just like his appearance, his name, and even his title, is in constant flux. Except mortal brains can't comprehend it, so to them, it's a continual Retcon, even in the same sentence. Michael's name has always been Greg, right? And John was always the god of chance. Her appearance makes perfect sense for a goddess of chaos - a Victorian dandy with a top hat. Just look at how Jim waves his tentacles. Apparently, he is responsible for accidentally creating all demons. In Nowhere Boys the feature film "The Book of Shadows" featured Tegan as the Big Bad who is revealed to be the personification of Chaos having taken human form. She is the polar opposite to her brother, "Bear", who is the personification of Order. Q from Star Trek: The Next Generation is explicitly referred to as "next-of-kin to chaos". In some EU media, he's even called a god of chaos (among other similar epithets). Greek mythology has Chaos, which represents the Classical view of chaos being a void of unorganized nothing that predates existence. It is where the earliest generation of gods came from, though it's ambiguous whether Chaos is sentient or not. Eris represents the more modern idea of chaos, being in the goddess of strife and discord. This usually involves her sparking conflict mainly for fun. Her daughter Dysnomia represents chaos in the form of lawlessness. Egyptian Mythology: In Ancient Egyptian mythology, the world is divided into forces of order against chaos. The ultimate chaos god is Apep, a monstrous serpent and God of Evil who wants nothing more than to destroy the universe. Set was originally a positive god of chaos, deserts and storms, but was later demonized into a God of Evil. Despite this, he still hated and opposed Apep. Zoroastrianism has Angra Mainyu (also known as Ahriman), who equally serves as the God of Evil and Evil Twin in direct opposition to Ahura Mazda, the God of Good and order. Unlike Judeo-Christian views of the Devil being weaker than God, Angra Mainyu is the equal of Ahura Mazda. However he will lose in the end anyway, due to self-defeating nature of chaos and evil. In his Circle DVD, Eddie Izzard states that he prefers the idea of a flawed God of Chaos to an all-powerful God as portrayed in the Abrahamic faiths. In his version of the creation story, Chaos lives in a caravan in deep space and accidentally created the universe when his oven exploded while he was trying to bake a flan. Warhammer (as well as Warhammer: Age of Sigmar and the sci-fi themed Warhammer 40,000) has the Chaos Gods, who collectively represent chaos, corruption and the extremes of various emotions and concepts. While arguably the largest overarching threat, who'd want nothing more than the physical universe to fall into chaos, they aren't evil so much as they are the extremes of what they embody like anger or trickery. It's just due to the dark setting and the fact they embody all sentient feelings and thoughts their negative traits come out more often. Many of the more powerful members of the Chaos-archetype from Yu-Gi-Oh! qualify as this to varying degrees. As "Chaos" in this context represents the combination of light and dark (and duality in general), their names and abilities all imply them to be the embodiments of powerful abstract forces such as light, darkness, beginnings, endings, inexistence and The End of the World as We Know It. Lucifer from Shin Megami Tensei. If he's not presented as a Fallen Angel, he's this: the incarnation of Chaos itself, a primal force of revolution and change to counterbalance YHVH, who represents dogmatic order. In The Elder Scrolls series, the Daedric Princes are generally considered Chaos Gods in comparison to the more ordered Aedric deities (with the notable exception of Jyggalag, who claims Order as his sphere of influence despite being a Daedra). The Daedra who most strongly embody Chaos include Mehrunes Dagon Prince of Destruction, Revolution, and Change, Sheogorath Prince of Madness and Creativity, and Boethiah Prince of Deceit, Conspiracy, Treachery, and Sedition. Heroes Of Might And Magic Ashan has Urgash, God of Chaos and brother of Asha the Goddess of Order. He warred with Asha when she claimed the right to create the world, and spawned the first demons in a mockery of the races she populated her world with, shaping them after the traits of chaos he saw within himself (madness, hunger, proliferation, pain, destruction and hatred). Kirby Star Allies: The Bonus Boss at the end of the True Arena mode in the hardest difficult is Void Soul, a Palette Swap of the Final Boss Void Termina that's referred as "Essence of Chaos". The Trickster from the Thief series is a powerful Nature Spirit who embodies the chaotic aspects of the natural world and dreams of the collapse of human civilisation. Pagans worship him as the god of Chaos, Nature and Magic, while The Hammerites, who worship the concepts of Order, Technology and Civilisation, despise him as a Satanic Archetype. A-gnosis' comics on Greek myth include Eris, goddess of chaos, as a Gadfly whose idea of livening up a family party is to engineer the exposure of a couple's Secret Relationship right in front of their mothers. Needless to say, Zeus hadn't invited her to the party. Slightly Damned: Father Syndel, the lord of demonkind and co-creator of Medius, is sometimes referred to as the god of chaos and his creations all have wildly varied appearances to reflect this. GOLB, the mysterious red entity briefly seen in "Puhoy", is revealed to be a Cosmic Entity that represents discord and chaos. It shows up to be an Almighty Idiot who mutates things into monstrosities with its breath, and was the reason Magic Man turned into a jerk by eating his girlfriend Margles. The Lich claims to be "the last scholar of GOLB", and it's implied that GOLB created it with its spit along with its power possibly leading to the Great Mushroom War. Marceline's father Hunson Abadeer is a devil of chaos, as the Nightosphere explicitly thrives on chaos and disorder. He achieves this with an evil amulet that turns him into an Eldritch Abomination, acting as an Obstructive Bureaucrat that dishes out pointless rules and cruel tricks on apathetic and confused demons. Aladdin: The Series: Chaos is an entity in the form of a blue winged-cat who prefers a bit more chaos in everyday life, and doesn't like things that are predictable or a regular occurrence. He also doesn't like being manipulated, so when Mirage tries to use him to destroy Agrabah, Chaos sets things up that Mirage would end up saving the day. He is not all powerful however, as he can't go against Fate. The Grim Adventures of Billy & Mandy: Like in Greek mythology, Eris acts as the goddess of chaos who screws over mortals for fun. She has a relationship with superntural hunter Hoss Delgado, which at a point distracted her that she couldn't fulfill her duties which led to the natural order being thrown out of whack. The Legend of Korra has Vaatu is the spirit of Chaos and Darkness, a God of Evil eternally opposed to Raava who's the spirit of Order and Light. My Little Pony: Friendship Is Magic: Discord is the spirit of chaos, disharmony and, well, discord. A Reality Warper who ruled over a dark time in Equestria, he brings about a World of Chaos until the main characters turn him back to stone through The Power of Friendship. He later undergoes a HeelFace Turn, but remains a spirit of chaos and very fond of both reality-warping magic and general trickery.